A city-levelling monster or a cuddly toy? 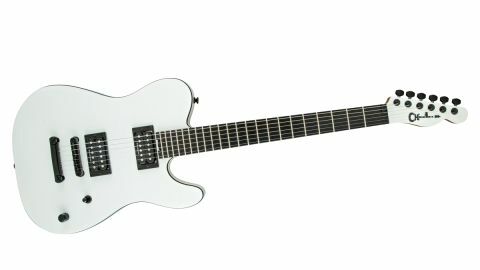 A superb guitar that will please Gojira fans and non-fans alike. At this price, there’s little to grumble about. Joe Duplantier describes his Charvel signature model as “a killing machine with class” (the same could be said of his band, Gojira). This Charvel Joe Duplantier does something similar: adopting the sophisticated broad strokes of classic guitar design and appropriating a Fender Telecaster headstock for genuine retro kudos to offset a beefed-up, T-style body shape. Borrowing from the classics and tooling them up for battle is Charvel’s speciality, so who better to execute Duplantier’s vision? Charvel produces a custom shop version with an astronomic price tag but in judiciously cutting the spec where necessary, this mid-priced Pro-Mod series preserves a lot of that original feel and sound at a price that most of us can entertain. Sure, the pickup selector feels a little flimsy but with its minimalist satin white finish and the absence of any fret markers (Duplantier’s custom has a Gojira ‘G’ at the 12th fret), the Pro-Mod Duplantier arguably looks cooler than its high-rolling kin. It certainly satisfies the key criterion for a good signature guitar: anyone can take it off the shelf and make it their own. The economic compromises make sense, with the mahogany neck and body of the custom shop model being downgraded to nato (so-called Eastern mahogany), and instead of the Charvel custom-wound humbuckers we have a nice set of super-hot Duncan Designed HB-103s. Duplantier’s tone balances low-end power with a harmonic brilliance, typified by his trademark pick scrapes and natural harmonics, and those sorts of metal pyrotechnics are mother’s milk to his Signature Model. Played clean the Pro-Mod is persuasive with lots of gutsy Americana twang from the bridge pickup, with warmer, woodier cream in the neck - perfect for creepy intros or blues, while cranking up the gain sees the Duplantier in its element. There’s a tightness to its rhythm tone, a disciplined grunt, and yet you can tease all sorts of harmonics from it. This guitar feels alive, with a compound radius neck and smooth oil finish that are supremely comfortable for chord work or ripping leads. A neatly sculpted heel adds to what is a most accommodating instrument. It’s built in honour of Duplantier, and that’s great for Gojira fans. Moreover, its wholly shreddable playability and monstrous tone make it one of the most exciting mid-priced electrics this year.